As a manufacturer of precision couplings and torque limiters, 3D representation of products is of great value to R+W Antriebselemente GmbH. Interested sales partners, buyers and / or suppliers can use the CAD product configurator on the company website to obtain a calculable representation of their made to order coupling, which they can zoom in on, rotate and compare with a 2D drawing using relevant presentation tools. Following on from this, the system also offers the user the ability to transfer the generated coupling model directly into their own CAD system with just one click. The online CAD tool reduces development time and increases productivity – with the positive result being reduced development costs. The recent introduction of the additional “Request” function simplifies the process of buying a product. Once the coupling has been configured, it can be requested directly from R+W with just a few clicks. If users have previously registered in the Download Center, their data will be filled in automatically and linked to the product. Any quantity can be entered. Once the data is complete, it is sent to the sales team by clicking on the Send button. 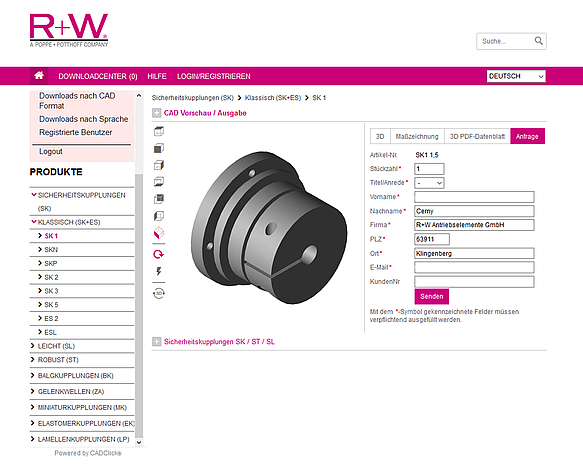 With the newly expanded CAD configurator, selection of R+W products has never been easier.